Have you ever tasted fondant in the can from the store? It tastes like medicine. 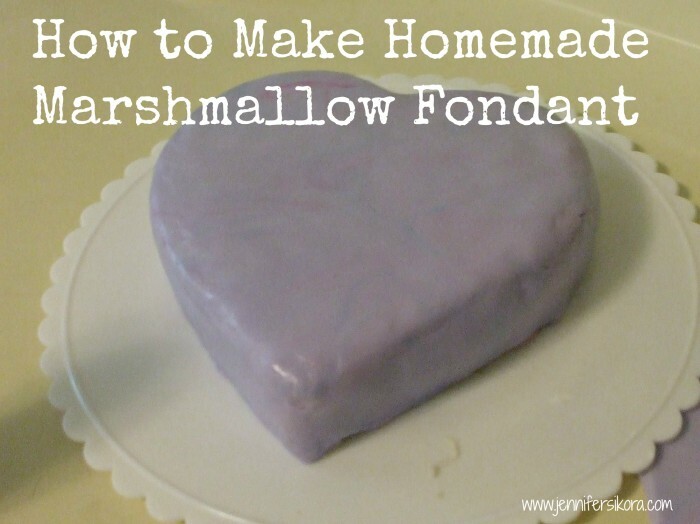 My daughter and I discovered a recipe on how to make your own homemade marshmallow fondant. This fondant is made using marshmallows and powdered sugar. 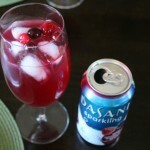 It mixes well and is very easy to work with — just make sure to have some gloves so that you do not color your hands. The first thing you need to do is grease a large glass bowl with oil. Don’t overdo it, just enough to lightly grease the inside. Add the marshmallows and water into the bowl. Microwave on high at 20 second intervals, stirring after each one until marshmallows are all melted. Now that you have this little ball of fun, take some of the reserved powdered sugar and sugar up your workspace. Knead and knead and knead until it becomes a VERY smooth and pliable ball (it took me and Kayla about 15-20 minutes). Once you get the ball all kneaded and smooth, like I said, it takes a while. . .kneading, kneading, kneading. 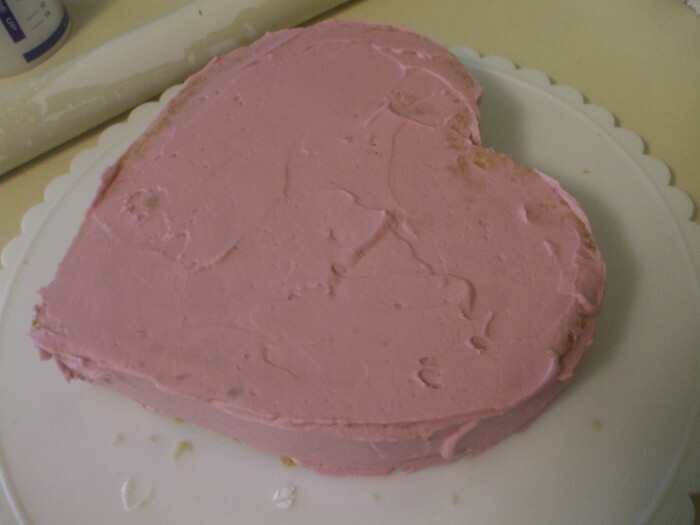 . .
You have to use CAKE DECORATING GEL (not food coloring). If you do not use the right thing, it will not turn out. 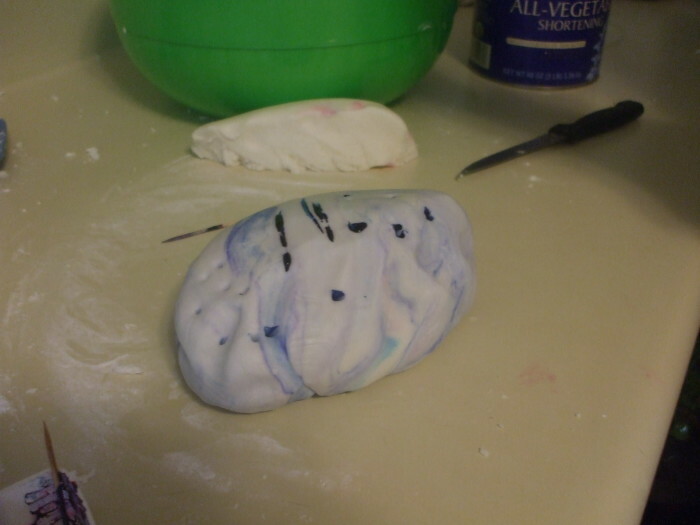 Put some of the gel on a toothpick and insert the colors into the fondant. Now the fun part happens. 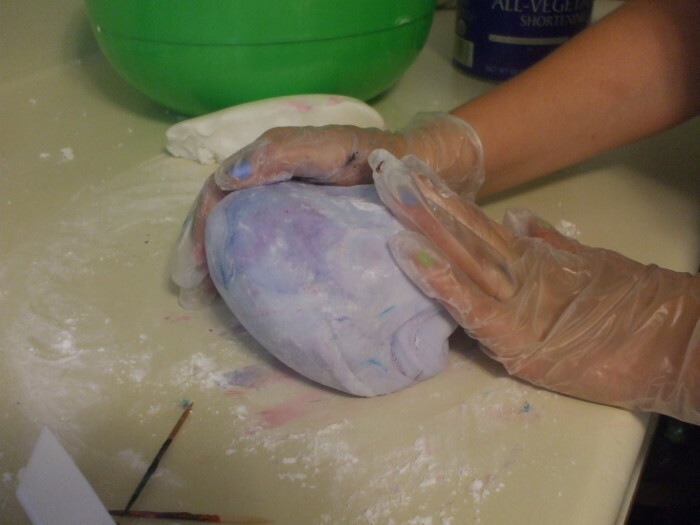 You get to knead AGAIN–but this time you are working the colors into the fondant. It takes a little patience for this part. If you want to keep your hands from getting the gel stained on them, use gloves! 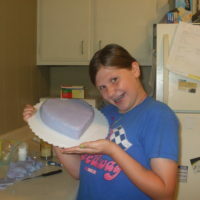 After you get done coloring the fondant, grease it up and then wrap it in plastic wrap and set it on the counter overnight. The next day, you get to roll the fondant out. At first touch it will feel really rock hard. Remove the fondant from the wrap. Put down a piece of wax paper as big as you are going to roll your fondant. 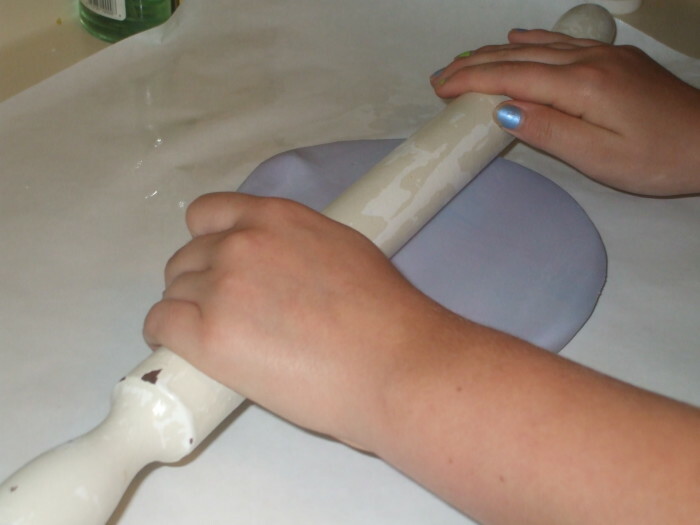 Get your rolling pin and start rolling (apply pressure). You will have to roll and roll and roll and roll until you get it to about an 1/8″ thick. You should not have any problem with it sticking, but if you do, simply oil the surface and then roll it out. When you are done rolling it out, you are now ready to put it on your cake. 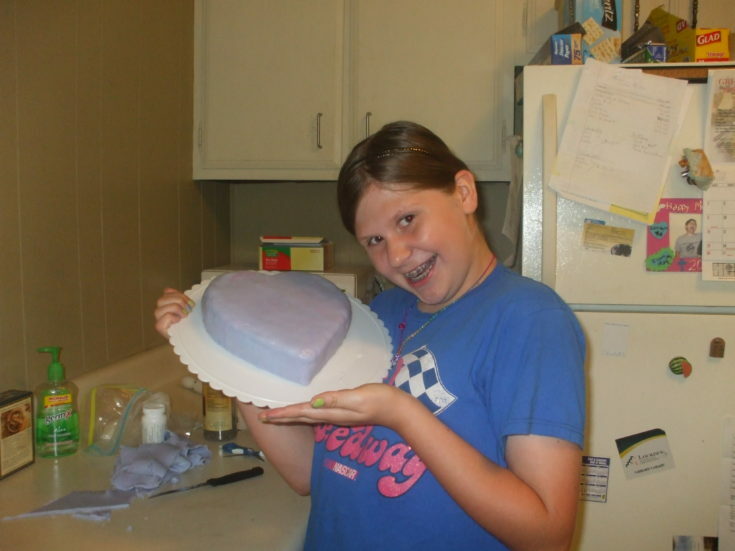 Before you do though, you need to put a very thin layer of icing on your cake so that the fondant will stick to it. 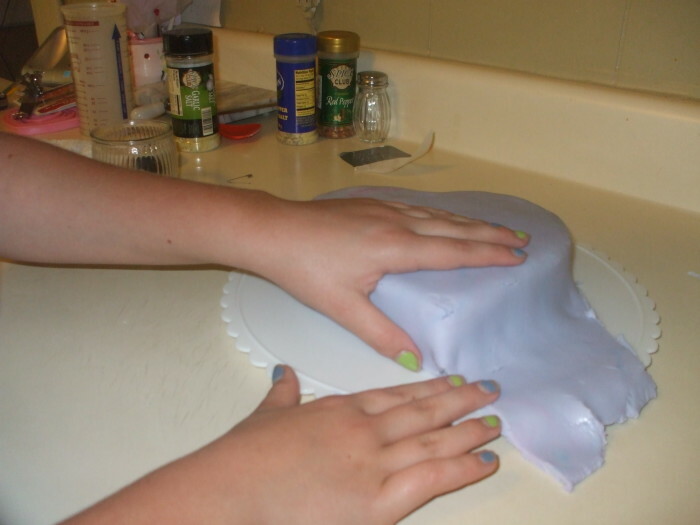 Now, very gently apply your fondant to the cake. 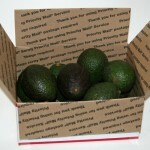 It should be lain over as gently as possible (this is where the wax paper comes in handy). 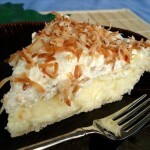 Cut away any excess and start shaping around your cake. Use oil and your fingers and palms to smooth away any wrinkles that might appear. Now you can have fun decorating it all up for who ever. Enjoy! Place the marshmallows and the water in a large microwave-safe bowl. Microwave on high for 1 minute, until the marshmallows are puffy and expanded. Stir the marshmallows with a rubber spatula until they are melted and smooth. Keep heating in the microwave in 30 second increments until all the marshmallows are melted and the mixture is smooth. If you want colored or flavored fondant, you can add food coloring gel and 3/4 tsp extract/flavorings. Stir until incorporated. If you want to create multiple colors or flavors from one batch of fondant, do not add the colors or flavors now. Add the powdered sugar and begin to stir with the spatula. Stir until the sugar begins to incorporate and it becomes difficult to stir. Dust counter or a large cutting board with powdered sugar. Scrape the marshmallow-sugar mixture out onto the prepared work surface. At this point, you may notice that the sugar is not all incorporated yet. This is normal. Your dough will be sticky and lumpy. 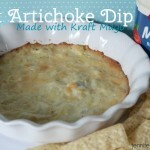 Dip your hands in shortening and coat well. Begin to knead the fondant mixture like bread dough, working the sugar into the marshmallow with your hands. Continue to knead the fondant until it smoothes out and is no longer sticky. Add more sugar if necessary, but stop adding sugar once it is smooth--too much sugar will make it stiff and difficult to work with. 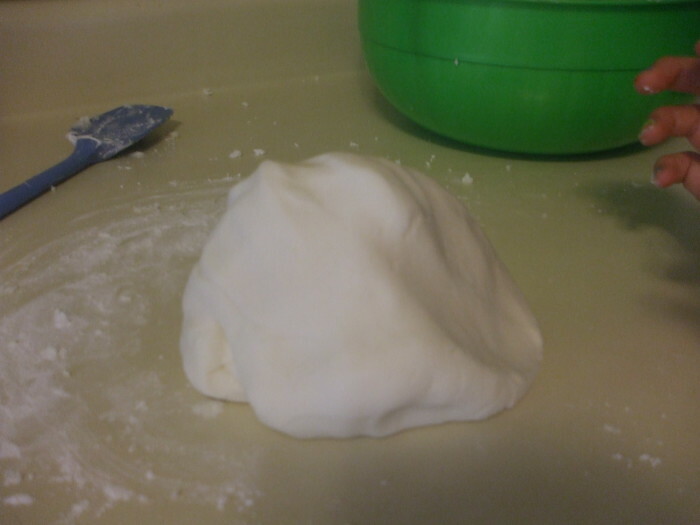 Once the fondant is a smooth ball, wrap it up and set it aside until the next day. The next day, roll it out or shape it. If you do not want to use it right now, just wrap it up. 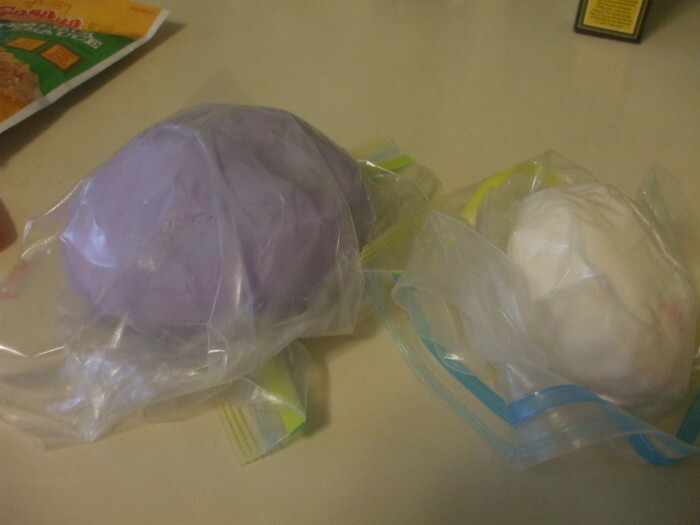 Well-wrapped fondant should be placed in a ziptop baggie and stored in a cool room or in the refrigerator. It will need to be kneaded until supple before later use. If you want to add several colors or flavors to your fondant, flatten it into round discs; one for each color you plan to use. (Note: you might want to wear gloves to avoid getting food coloring on your hands) Add your desired amount of coloring gel or flavoring to the center of the disc, and fold the disc over on itself so that the color or flavor is enclosed in the center of the fondant ball. Begin to knead the ball of fondant just like you did before. As you work it, you will see streaks of color coming through from the center. Continue to knead until the streaks are gone and the fondant is a uniform color. Your fondant is now ready to be used or stored.